Here's a tour you can take if you want to walk around a bit. Parking is available at the corner of Welland Vale and Sawmill Rd and a small foot path can take you from Sawmill Rd up to the Welland Ave Bridge. Click on the map to jump to a description and picture for each item. Welland Vale: The Welland Ave. bridge is a good place to get a look over the entire valley. 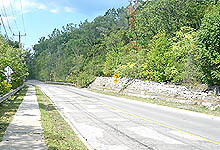 The channel of the First Welland Canal can be seen on the right (west) side of the valley trailing toward the second Welland Canal at the far end of the valley. Factory Building: Ever since William Merritt operated a Mill here in the early 1800's, Welland Vale has always been associated with industry. 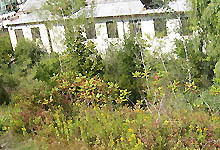 The buildings in Welland Vale are much more recent than the canals, the oldest being built in the 1930's. 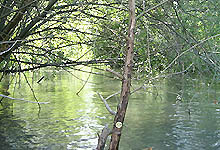 12-Mile Creek: The following shot is also from the Welland Ave Bridge. 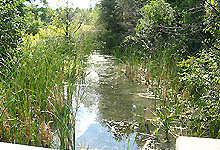 It shows the 12 mile creek going down the channel of the Second Welland Canal. You may wonder how boats could ever sail against all this water? 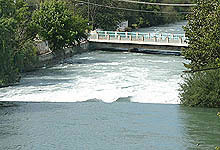 The water volume today is actually about 100 times what it was when the canal was in use. It's coming from the DeCew Hydro generating station 5 kilometers upstream. Welland Vale Road: Welland Vale road entering the valley just before it turns unto the bridge and into Welland Vale. 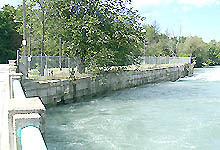 Lock 2 - Second Welland Canal: You can still see one of the walls of lock 2 on the southwest side of the channel. 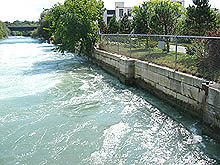 The far side of the channel was removed to improve water flow. 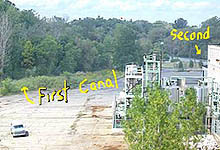 Lock 2 - Second Welland Canal: Another shot this one showing the water leaving downstream Again the one wall of Lock 2 is still there. Channel of the First Welland Canal I: It's amazing how distinct the channel of the first canal is here. After 180 years it still remains straight with defined edges. This shot looks toward the Welland Ave. Bridge. Channel of the First Welland Canal II: Closer to 12-mile creek, fresh water fills the old channel giving a clearer view of the stream.